Meet Our Team - Animal Clinic of Chardon, Inc.
Drs. 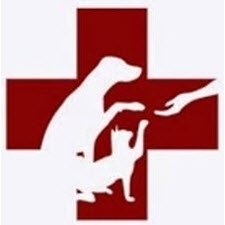 Tom and Wendy purchased the Animal Clinic of Chardon in 2001. Drs. Tom and Wendy moved to Geauga County shortly afterwards and now reside in Chesterland with their two children. Their four-legged family members include five dogs: Sari, Tulip, Bear, Lela, and Bandit and four cats: Freckle, Piper, Sweetie and Hickory (all are rescues). Their rodent family includes two clever cavies named Maxine and Ruby. Dr. Tom has also created two beautiful fresh-water fish tanks. More recently, Drs. Tom and Wendy completed their dream of building a new, state-of-the-art hospital. They couldn't be more excited how it turned out, reinforced by the many compliments from customers and members of the community! For fun, the Frankmanns enjoy socializing, thankfully enjoying the close proximity of many family and friends. Anything nature excites them, from their back-yard to not-so-near and exotic places. Dr. Wendy enjoys cooking, reading, movies, and exercise if time permits. Dr. Tom earned his Black Belt in Taekwondo from Chardon's Karate for Kids (chardonata.com). 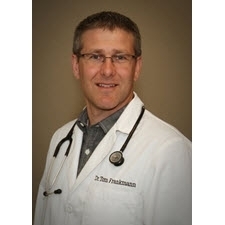 Dr. Tom Frankmann received his Bachelor's degree in Chemistry from Miami University in 1993. In 1997 he received his Doctorate from The Ohio State University College of Veterinary Medicine where he was elected to the Phi Zeta Veterinary Honorary Society his senior year. Dr. Tom has worked to enhance his special interests in surgery and dentistry, behavioral consultations, and specialized senior pet care. Dr. Wendy Frankmann graduated in 1993 from John Carroll University with a Bachelor's degree in Biology and a minor in Sociology. Since graduating with her Doctorate from The Ohio State University's College of Veterinary Medicine in 1997. Dr. Wendy has worked to create a balance between her love and compassion for animals and her family. 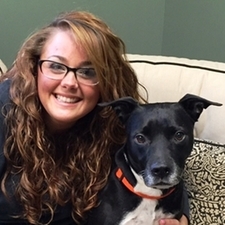 She is also a graduate of the Ohio Veterinary Medical Association's Leadership Academy. Her medical interests include effective wellness care, pain management and rehabilitation. Dr. Jessica DeMarco is originally from Conneaut, Ohio. 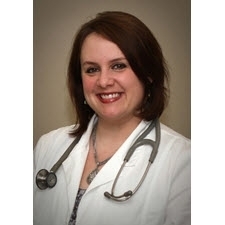 She graduated from Mercyhurst College in 2004 with a Bachelor's degree in Biology and she received her Doctorate from The Ohio State University College of Veterinary Medicine in 2008. In her free time, Dr. Jessica enjoys travel, socializing with family and friends, and watching live music. As an OSU alumni, she is also a huge Buckeye football fan! Dr. Jessica shares her home in Painesville Township with her furry family consisting of two senior beagles, Gracie and Pete (also known as Team Beagle), a 20 year old turtle named Rerun, an orange tabby cat named Jif (formerly a blood donor at OSU who saved 15 kitty lives! 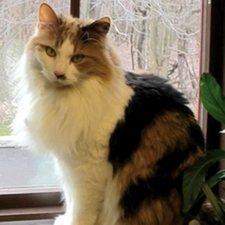 ), a fetching tiger cat named Jackson Browne, and three Animal Clinic of Chardon rescue kitties, Banana, Howard, and Rosie. Some people fondly call Dr. Jessica "cat lady." Dr. Jessica is interested in all facets of veterinary medicine especially feline behavior and medicine, internal medicine, and senior care. 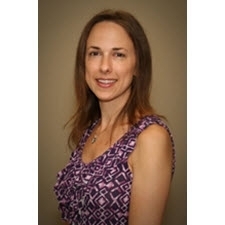 She thoroughly enjoys learning new things and attends several continuing education seminars and conferences every year. 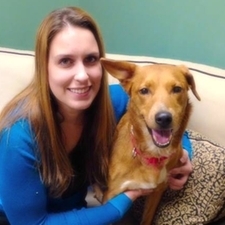 Dr. Jessica's goal is to support the human-animal bond through care for pets and the people who love them. She enjoys doing so every day at the Animal Clinic of Chardon. 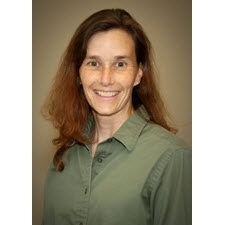 Dr. Carolyn Askew is originally from Annandale, VA. She received her Bachelor degrees in Biology and Animal Science in 1990 and 1991 respectively from VA Tech. She received her Doctorate from the VA-MD Regional College of Veterinary Medicine at VA Tech in 1996. (Go Hokies!!!!!) Dr. Carolyn moved to Ohio with her husband Dr. David Askew PhD, when he accepted a position as an immunologist at Case Western Reserve University in 1997. 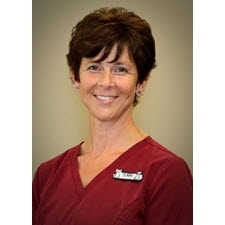 Dr. Carolyn resides in Chesterland with her husband, two children, 3 dogs and 1 cat. She spends her free time running her kids to all their many activities! She is addicted to crochet and knitting and loves to read. She enjoys spending time with the many friends she has made since moving here. In her 18+ years here she has pursued many interests including obedience training and competition with her previous dog (a sheltie) as well as earning a second degree black belt in Taekwondo along with her family. Dr. Carolyn has a profound interest in internal medicine. She is always looking for new ways to expand her knowledge so that she can improve her patients' quality of life by giving the best care possible. She also loves to mentor and teach young people. She speaks every year at various schools in the area in regards to veterinary medicine as a career. 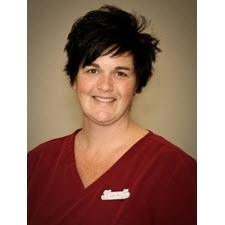 Jodi has worked with animals since 1998, when she took a part time position working at a veterinary clinic and kennel. She received her Bachelors of Science in Biology from Kutztown University. 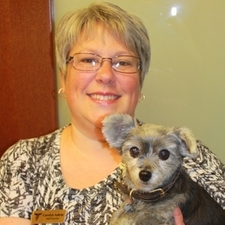 In 2007, Jodi received her Registered Veterinary Technician Degree and certification. She joined the ACOC team in early 2002. Jodi was born and raised in eastern Pennsylvania, but now resides in Geneva, Ohio with her seven furry kids, Lager and Cade, two black labs, and her cats, Hercules, Barry, Popeye, Mosey, and Rowan Red Beard. She enjoys spending time with her friends and being the "aunt" that spoils the kids. She also enjoys reading, and golfing. Jodi's favorite part of her job is being able to help our furry companions that can't speak for themselves. She has a special interest in hospice care for pets. Terri has been with ACOC since 1996, in the role of veterinary nurse. She has loved and wanted to be near animals for as long as she can remember. Before joining the ACOC, she worked at a stable, a kennel, and a pet store. Terri lives with her husband and son. They share their home with 1 dog Gia a young loving Cane Corso mix, 2 cats: Willy 12 years old, and BumbleBee 5 years old. She also shares her property with a Quarter horse Andy who is 29.5 years old, and two miniature donkeys, Sammy who is 15 and Petunia who is 17 years old. In her spare time, Terri enjoys sharing her love of animals and the outdoors with her son who is also an animal lover. Terri says that her favorite part of her job is educating clients with new puppies or kittens. If there was a test to grandfather an assistant Terri would pass with flying colors. Working as a veterinary Assistant since 1996, she has participated in many educational workshops. Chloe has worked in the veterinary field for about 1.5 years. She joined ACOC in Spring of 2016. She has two dogs, a chihuahua named Lola and a Jack Russel mix named Rilee. She loves riding four wheelers and spending time with her dogs & fiance. Chloe's favorite thing about ACOC is the awesome staff. She is interested in Dentistry and hopes to become a dental specialist in the future! 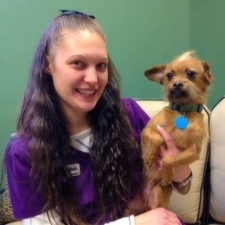 Kristine's smiling face and warm personality has been winning over our patients and their people since 2014 as one of our Veterinary Assistants. She has worked in the veterinary field since 2011. Kristine and her husband have two little boys. No veterinary assistant's family would be complete without some fur kids and Kristine is no exception. Their dogs Odie and Franklin and cat Tigger complete their family.When not at ACOC, Kristine likes knitting scarfs, making crafts with her son, swimming, and going to water parks. At ACOC, Kristine's favorite tasks include interpreting cytology and record keeping. She is very organized and you will rarely see her without her yellow notepad, taking notes and monitoring her to do list. Kristine enjoys the team work, communication and organization of our ACOC team. In her words, "I am so thankful to be a part of a team that works together and helps each other achieve the goal of happy, healthy, stress free animal companions." 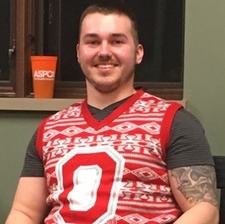 Mike has worked at ACOC for about a year and is his first experience in the veterinary field. He has 4 cats at home - Pooh, Luna, Atlas and Benny. Mike is very much into weightlifting and has become the "go to guy" when we need help with the big dogs! He loves watching movies and relaxing with all his cats cuddled around him. His favorite thing about being on our team is meeting all the patients, especially the boarders! He has a lot of fun with them in the play yard during their breaks. Mike says it's very rewarding to know that he gets to give them some fun time while they are away from their families. Mike has a degree in Zoology and his goal is to continue working with animals for many years to come. He has always dreamed of working with bears! 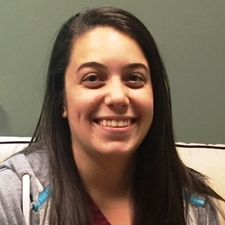 Jessica began working at ACOC in December 2015. It is her first time working in the veterinary field, however she has been around/working with animals since she was very young. One of her first jobs was working at Lake Metroparks Farmpark. Jessica currently has a black lab/chow mix named Stormie who greets her at the door when she gets home. She also has a guinea pig named Chico. In her free time, she spends her time dancing, horseback riding, swimming, taking adventure to new places, and twirling. She also teaches dance and started her own baton company when she was 15 years old. She is also is working towards an Associate's Degree in Veterinary Technology. Jessica's ultimate goal is to become an animal control officer and help rescue mistreated and abused animals. Her favorite thing about ACOC is the very friendly and uplifting environment here. She also enjoys meeting some of the patients and using her time here as a great learning experience. She is very glad that she has the opportunity to be a part of the ACOC team! Jessi has been the Office Manager at ACOC since 2001 and is the "go to" person for all things concerning running the business end of the Clinic. Her attention to detail makes her well suited for this role. Jessi was born and raised in Lyndhurst, Ohio, but now resides in Willoughby with her husband and daughter and she loves her new role as a mom! She works part-time at the ACOC and is very fortunate that she can be a stay at home mom as well. When not at the Clinic, Jessi enjoys spending time with her family, especially her nieces and nephew. She also likes to exercise and has a special interest in health and nutrition. An animal lover her entire life, she has a special love for guinea pigs and is an expert in their husbandry. Of course, she doesn't mind getting her fix of puppy breath, either! Ask me how I've eliminated chemicals from my home and family environment. Kim, who has been with ACOC since 1990, graduated from Lake Erie College with a Bachelor of Science in Biology. Her family includes her husband and their two children. They share their home with a fun loving yellow lab named Oliver. When Kim is not at work she enjoys outdoor activities such as horseback riding, four-wheeling, snowmobiling, and also relaxing with family and friends. Kim has loved bonding with all of the animals that come through the clinic's doors, and watching them grow through the years. "Life is short. Break the rules, forgive quickly, kiss slowly, love truly, laugh uncontrollably, and never regret anything that made you smile." 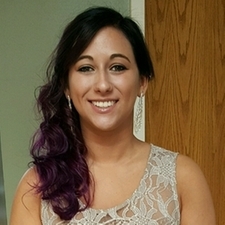 Karly has been working as a client service representative at ACOC since 2014. She is new to the veterinary field in general but is learning very quickly! Karly enjoys her new position very much, especially watch puppies growing at each visit. When not at work, Karly is busy caring for her young family. She has an almost 4 year old son and 2 year old twins with her husband. They also have a beautiful retriever mix named Amy (pictured with Karly). In her free time, Karly enjoys cooking and reading. Tim has been working at ACOC as a client service representative since 2014. This is his first job in the veterinary field but he is no stranger to working with animals and has a passion for helping them. 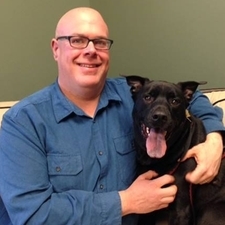 Most of Tim's free time is spent volunteering at the Ashtabula County Animal Protective League as their volunteer coordinator and board member. He especially loves helping with adoption events as he finds it so rewarding when a pet gets a new family. He truly feels that rescued pets make the best pets! Tim's passion for animals is evident when you see him snuggling a little kitten or speaking gently to a nervous dog here at ACOC. Tim and his wife have five rescue dogs of their own: Copper, Rusty, Ryley (pictured), Baylee and Dexter. In addition to spending time with his wife and fur kids, Tim enjoys making homemade soap and loves to visit Disney World with his wife as often as possible. At ACOC, Tim really enjoys getting to know of our clients and patients! He loves to learn to new things and feels like he has learned so much here. He appreciates that he can always ask a fellow team member and they are willing to help out. We are positive that you and your pets will enjoy interacting with Tim as much as we do! "We keep moving forward, opening new doors, and doing new things, because we're curious and curiosity keeps leading us down new paths." - Walt Disney. Lisa has been working at ACOC since August 2015, and she has had a passion for animals for most of her life. She has 4 furbabies at home. Two cats-Weezer & Jezebel. and two dogs, Lady Bird & Buddy. Lisa and her husband Nick have been married for 4 years. They have known each other since middle school, so ending up together has been pretty amazing. They do not have any children yet, but all of their furry kids are keeping them busy! In their free time, Lisa and Nick enjoy going on adventures with their "kids" and hanging out with their family. Fellow ACOC staff member Kristine Sheets is Lisa's sister-in-law. She loves spending time with Kristine, her brother Mike, and her nephews Bradley & Ryder whenever she can. Getting the opportunity to work at ACOC has been such a joy for Lisa so far. Being able to come home with a smile on her face, sharing all the different aspects of her day with her husband, and knowing that she could possibly have made a difference in someone's life is beyond fulfilling to her. She loves that she is a part of a team that has made a career out of helping and caring for animals. Lisa is grateful that everyone has been very welcoming and are willing to help her learn. 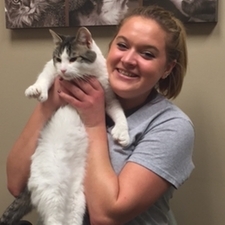 She feels blessed to be a part of the ACOC team and is considering going back to school to further herself in the veterinary field! Angela recently became a CSR, but previously was a veterinary assistant for 5 years and a kennel manager for 1 year here at ACOC. She has a dog named Marbles, 2 cats Toothless (three legged) and Jules, a ball python named Peanut, a ferret named Roger, and lots of fishies: Sam, Dean, Bobby, Frederick, Riley , Eddie. While not working, Angela enjoys pet sitting and going out dancing with friends. Her favorite thing about working at ACOC is helping our patients and providing comfort to them. She especially loves seeing the puppies and kittens, but she truly loves our Angel fund. Angela loves being involved in it and raising money for animals in need. Kiki is our official ACOC hospital ambassador. She has been with us since June of 2012. Kiki was brought in by a Good Samaritan who found her on the side of the road suspected to have been hit by a car. We treated her for shock and pain and took some x-rays. We found that Kiki had a shattered pelvis and was unable to walk. It was a long shot, but we all fell in love with this little girl so we decided to utilize our Angel Fund to provide intensive care for her. After about one month of therapeutic laser treatments, traditional pain medicine, physical therapy, and cage rest, Kiki took her first few unsure steps. She decided that she liked us so much she wanted to stay! When we moved in to our new hospital, Kiki realized she found a home with several caretakers to love on her and cuddle her. She now runs around the hospital like a champ and even climbs her personal cat tree like it is nothing! In Kiki's spare time she likes to eat, boss the staff around, taunt other kitties, and get petted and fed. Her favorite thing about living at ACOC is all the staff that loves her so much! You may see this sassy girl meandering around next time you stop in.